When you think of the hub of technology, Silicon Valley probably comes to mind. But that's slowly changing, as more cities across the country become fast-growing technology hubs. And now, with Amazon's recent announcement that it plans to expand corporate offices to Detroit in 2016, the Motor City is poised to the next hot spot for tech. "We have a long-term plan to grow our presence in the great state of Michigan, and bring more full-time, high-tech jobs to the city of Detroit," said Peter Faricy, vice president for Amazon Marketplace, in a press release released by the company. "We are focused on hiring in the state and look forward to being a part of the community, professionally and personally. Michigan is a rapidly growing technology corridor and we're eager to bring the incredible local Detroit talent to Amazon." And that's welcomed news for city that recently made headlines for financial issues, especially after General Motors and Chrysler filed Chapter 11 during the recession. But as of September 2015, the Bureau of Labor Statistics reports that the unemployment rate in the Detroit area is slowly decreasing, with a reported 5.6 percent unemployment rate, which is only slightly above the national average of 5.1 percent. And tech companies like Amazon are getting in on the ground floor. Currently, 7.1 percent of the U.S. economy comes from the tech industry, according to the Cyberstates 2015 report from CompTIA, and that number is only expected to grow, with an 11.3 percent rise in tech job openings from Q4 2013 to Q4 2014. And it's a profitable industry for workers, considering that in 2014, the average nationwide salary for the tech industry came in at just over $100,000, while public sector employees made an average of $49,000. Software jobs earned the highest average salary, at $132,600, followed by tech manufacturing at $102,700. IT services and telecommunications and Internet service weren't far behind, with average salaries of $99,000 and $96,000 per year, respectively. Compared to the 7.1 percent of jobs in the tech industry nationwide, just 3.9 percent of Michigan's economy came from the tech industry, according to CompTIA and data from the Bureau of Labor Statistics. In Michigan, the average wage for workers in the tech industry was $82,190 and the state ranked 12th for tech employment and 22nd for average tech wage. Amazon announced plans at the end of September to help continue this growth by creating a center of technology in downtown Detroit. The tech giant plans to build a corporate office to bring more full-time technology jobs to Michigan. And as a friendly introduction to the city, Amazon donated 30 Amazon Fire tablets to the Carver STEM academy program in the Detroit Public Schools, as well as $10,000. Amazon isn't the only company hoping to revitalize Detroit -- an agency was created to foster global partnerships in an attempt to bring more opportunities to Detroit residents. And in February Automation Alley, a technology business association and business accelerator focused on creating growth in Southeast Michigan, reported that the Motor City was on par with Silicon Valley in terms of technology job growth. Technology-related jobs have increased steadily from 2012, according to the report, reaching over 181,000 jobs in 2015. Occupations in technology management, computers and mathematics, architecture and engineering as well as life, physical and social sciences contributed to this growth. "It's been going on for quite some time," says Todd Thibodeaux, president of CompTIA, "Dan Gilbert, one of the founders of Quicken Loans, was an early leader in setting up shop in the Detroit metro area and urging other companies to follow him. 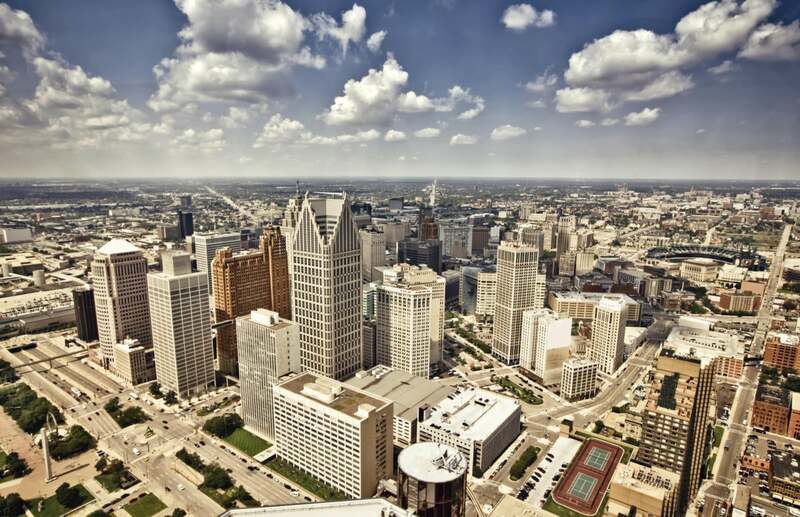 There is a well-educated workforce in Detroit and surrounding areas and low operating costs." And it certainly has been a long time coming considering Automation Alley was founded in 1999. Since then, membership from business, government, nonprofit and educational industries in Detroit and the surrounding eight-county region has grown to nearly 1,000. The efforts have paid off, with Southeast Michigan coming in first nationally for its number of engineering technologies and engineering-related field degrees earned, according to a 2015 report from the Anderson Economic Group. The report, which ranked 15 "tech hubs" across the country, also found that Southeast Michigan ranked second for the number of technology industry jobs in the Midwest as well as the number of technology-focused jobs. And it ranked third nationally for the number of STEM degrees earned and for the percentage of total employment in the technology industry. This isn't Amazon's first foray into Detroit either. The company has maintained strong relationship with universities in Michigan for recruitment and internships. "The state university system produces a high proportion of exceptional talent, many of whom would like to stay close to home," says Thibodeaux. The birth of new technology careers and opportunities is good news for those heading into college or just graduating with STEM degrees. Over time, companies hope that young people who want to remain in Detroit will look to companies like Amazon as strong career opportunities, says Thibodeaux. "Existing local talent might not be the prime beneficiaries of the initial companies, but long-term having a thriving tech hub will be a big benefit for those graduating from local universities." While Amazon might not be the first tech company to move in to Detroit, it may be one of the more influential, ultimately keeping Detroit on its upward swing and helping to further establish a strong tech community in a city that needs the economic boost.